As the Indian government accelerates cleanup efforts of the River Ganges, the conservation of dolphins in India's holiest, but most polluted waterway, is under the spotlight as the country conducts its first official count of the freshwater species. "This is the first time a unified survey will be done for an aquatic animal. It has been done for elephants and tigers but this is more complicated," Dr Sandeep Behera, consultant at the government's National Mission for Clean Ganga, told The Sunday Times. "We are doing the survey in winter, when water levels drop and we can capture numbers in small isolated pockets and get a good idea of the population." The government also hopes to gauge the health of the river in the process. "This time we have taken aquatic biodiversity as an indicator of how pollution is affecting the Ganges," said Dr Behera. 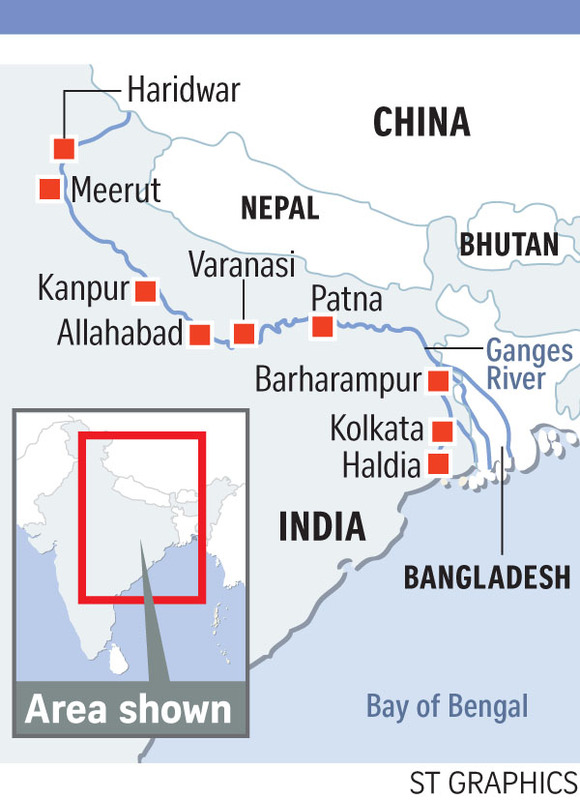 The 2,500km-long river, which is considered holy by Hindus, who believe a dip in it cleanses sins, is heavily polluted with millions of tonnes of industrial effluent, sewage and pesticides. Cleaning it up has been a goal for decades and the Modi government has pledged more resources to tackle the pollution, including allocating more than 200 billion rupees (S$4.3 billion) to the river. The dolphin unified count - meaning it is not just a piecemeal effort by individual conservationists - will provide baseline data that environmentalists say is crucial for saving the endangered species. Estimates put the number of the grey-brown mammals at between 1,500 and 3,600. "After the count, we will identify the hot spots and those areas will be given priority for protection and conservation," said Dr R.K. Sinha, head of zoology at Patna University, who has dedicated 35 years to the conservation of dolphins. The count would also help create a conservation network. Still, in 1996, the dolphin went from vulnerable to endangered on the International Union for Conservation of Nature list. "Degradation of habitat is the most important factor in the fall in dolphin numbers. Water flow is declining because of water-intensive farming and increasing pollution," said Dr Sinha. There is only one other river dolphin species, in the Amazon River, and a subspecies of the Ganges dolphin in the Indus River. "We want to know the exact number. It is very important for conservation efforts," said Mr B.A. Khan, principal chief conservator of forests in the state of Bihar. "We will also be surveying the smaller tributaries, which has not been done before." Said Dr Behera: "We hope the population has increased in pockets where they are getting support and food. But the target is to bring the endangered species back to the river system." Known locally in some areas as Susu because of the sound it makes when breathing, the Ganges River dolphin, distinguished from its ocean counterpart by a longer snout and stockier body, was once found in large numbers in the river and its tributaries. Over the past few decades, its numbers have dropped dramatically.